Rapid evolution of technology has drastically increased IT complexity for businesses of all sizes. Virtual-everything is now the standard and the rise of container-based applications has introduced new performance expectations along with big challenges around data persistence and protection. Ever tightening data retention regulations often demand that legacy storage systems coexist with these newer, more advanced technologies. When you layer a shrinking IT budget on top of the growing complexity, what you have is the perfect storm. Designed to help customers efficiently manage increasing storage complexity and demands, these validated solutions provide easy scalability and single pane management at a fraction of the cost of legacy systems — without trade-offs in availability, reliability, or functionality. Lenovo’s global leadership and innovation includes industry-leading reliability* and world-class performance for business-critical applications and cloud deployments. DataCore software turns ThinkSystem servers into very intelligent and extremely capable storage systems designed to meet your business requirements and provides easy deployment of software-defined storage (SDS) into your data center. Together, they are the perfect solution to get more efficiency and performance out of your storage infrastructure. While DataCore has been validated to run on any Lenovo ThinkSystem server, ideal units to complement DataCore software are the ThinkSystem SR630, SR650 and SR950. Both the SR630 and SR650 are designed to handle most data center workloads. The SR630 is a 1U 2-processor system and provides high performance and a large storage capacity. The SR650 is a 2U 2-processor system designed for speed and expansion with flexible storage and I/O options. The SR950 is a powerful 4U 8-processor system for workloads requiring large memory and storage capacity. DataCore Multi-Core Parallel I/O Technology, in combination with ThinkSystem's powerful Intel® Xeon® processors and high-speed RAM caching, are designed to service read/write requests quickly, while automatically moving data between spinning disks and flash to optimize performance. Data is mirrored in real time between separate storage systems to maintain continuous availability despite equipment and site outages. You can quickly and confidently deploy new storage technologies such as NVMe or conduct migrations with no disruption. Extensive automation frees system administrators to care for other parts of their infrastructure. The new Lenovo SDS solutions deliver easy expansion for scalable deployments, as well as integration with existing storage infrastructure, enabling you to grow your SDS deployment on your own terms. DataCore supports all of the popular storage devices from flash and disks inside servers to storage arrays and public cloud storage. DataCore software optimizes storage infrastructures with the highest levels of performance, availability, and utilization with innovation such as DataCore Multi-Core Parallel I/O Technology. 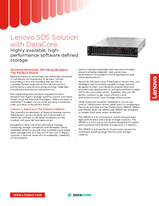 The Lenovo SDS Solution with DataCore allows you to unify, virtualize, and manage heterogeneous storage. Data services can be propagated across all storage arrays and the solution can be scaled up or out by adding more capacity or more virtualization nodes. In addition, the software takes isolated storage devices, sometimes spread between different locations, and places them under one common set of enterprise-wide data services. Pooling the collective resources, it manages them centrally and uniformly despite the differences and incompatibilities among manufacturers, models, and generations of equipment in use. Data powers many of today’s most innovative businesses, and the Lenovo SDS Solution with DataCore provides an affordable, highly efficient, and durable storage platform to meet the massive data growth. For more information on the Lenovo SDS Solution, contact your Lenovo representative or Business Partner or visit: lenovo.com/systems/storage. For indepth details, read the DataCore Software Defined Storage solution guide. Trademarks: Lenovo, the Lenovo logo, Lenovo XClarity, ThinkAgile, and ThinkSystem are trademarks or registered trademarks of Lenovo. Intel® and Xeon® are trademarks or registered trademarks of Intel Corporation or its subsidiaries in the United States and other countries. Other company, product, or service names may be trademarks or service marks of others. Document number DS0078, published December 4, 2018. For the latest version, go to lenovopress.com/ds0078.